"I am a city boy who works in the province", goes the first line of my blogger profile. That means on top of the stressful days and nights in the office writing reports and beating deadlines, or working under the scorching heat of the sun especially during plant maintenance shutdowns, I go home to an empty room, have to cook for myself and eat while having a one way conversation with the television. Blah. Bleh. Blah. Because of this, my weekends have become all the more focused not only on recharging and relaxation, but more importantly, spending quality time with my loved ones. The 2-hour rush home is always a build up of increasing excitement... and the best way arrive Home is with some awesome "pasalubong", of course! What Häagen-Dazs Flavor Are You? I've loved Häagen-Dazs since I was young boy. My favorite flavors include Dulce de Leche and Cookies and Cream. I even took the "What Flavor Are You?" test on the Häagen-Dazs Philippines website and found out my best match was the Belgian Chocolate flavor - "the soft Belgian chocolate flakes mixed with rich chocolate ice cream" - is just so perfect for me, my heart beats faster just reading the description. Haha! 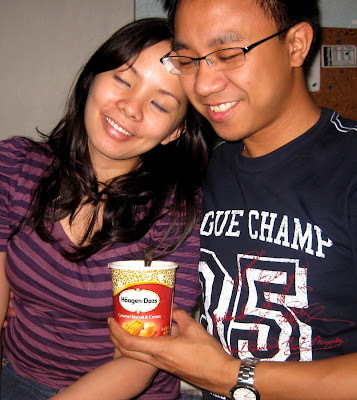 Blogging with Häagen-Dazs makes for an uber indulgent blog post! Haha! "Mmmm." The new Häagen-Dazs Caramel Biscuit & Cream has a rich creamy texture with a delightful crunch of decadent Belgian biscuits. I liken eating Häagen-Dazs to a symphony - it usually begins with a big entrance - I am always surprised at the explosion of taste in my mouth, and then come the nuances - the crunch, the caramel, and the rich creamy flavor all come together. It brings me to a high, the smile on my face stays until the very last lick off my spoon. The next morning at breakfast, Liz found my "pasalubong" and made us some "affogato". If you've never had some or heard of affogato, you might as well be missing half your life. Hehe! Espresso and Häagen-Dazs, an irresistibly delightful combination! "Affogato" is an Italian word that is literally translated as "drowned", but that is also the name of this delectable breakfast / dessert - an ice cream scoop topped with a shot of espresso. The slow melting creamy ice cream was a perfect match to the espresso. Delicious! 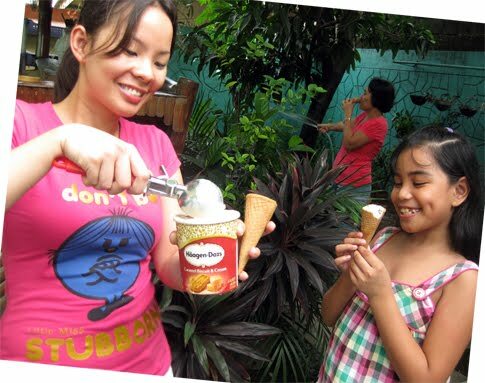 Of course the Pasalubong is meant for the whole family, so Liz gave some Häagen-Dazs to my mother and my little cousin Kat-kat - in ice cream cones! We all enjoyed the cool and tasty afternoon "snack" in the backyard while helping our mom tend to the garden. Häagen-Dazs in ice cream cones are best enjoyed under the sun! 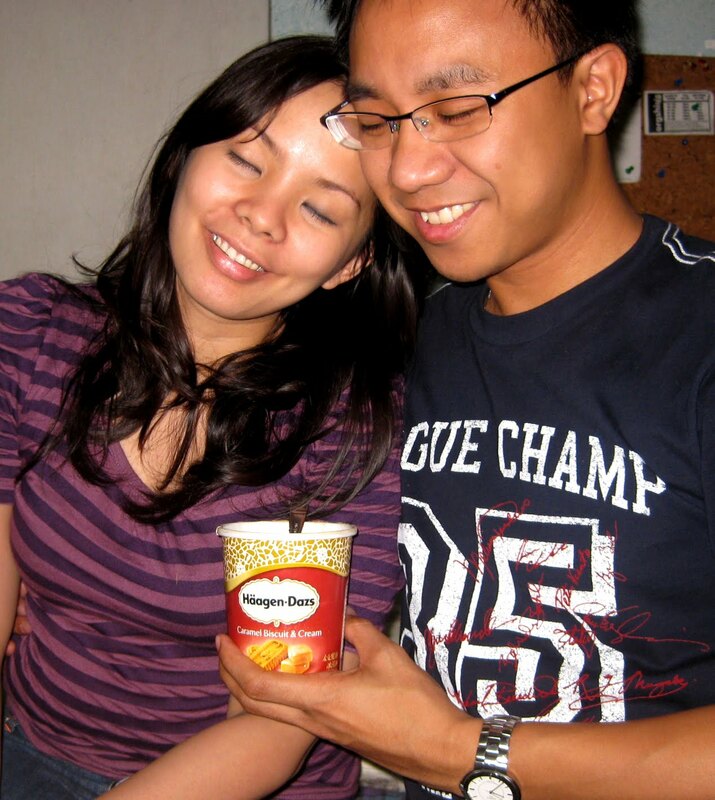 "Ang saraaaap...", as I savored the spoonful of Häagen-Dazs in my mouth. She took the spoon from me and helped herself to some. "Yummy!" she said. And I agreed. Do not disturb. Slow melting in progress. "Do Not Disturb. Slow melting in progress." We couldn't stop ourselves from indulging some more Häagen-Dazs Caramel Biscuit & Cream before going to bed! Woot! We finished the rest of that cup that evening! After all the creamy indulgence, melting away my worries and my stress, melting me into happiness, while sharing it with my loved ones... I was ready for another work week! And planning to pick up another pint of Häagen-Dazs Caramel Biscuit & Cream next weekend! How about you? How do you enjoy Häagen-Dazs at the end of a busy day? Oh, you and Liz are perfect together - looks like you had delicious fun working up this post! Okay, I'm hungry now.. time for some Häagen-Dazs! Oh, and I'm Belgian Chocolate, by the way.